Kinspa, a few steps away from the hotel and set in acres of parkland, has a petit swimming pool, a large hydrotherapy pool with a swim-through waterfall overlooking a water garden, plus an aromatherapy sauna and steam room. Treatments use Elemis and Willow Organic products, and food served in the Zen Lounge is Thai-themed. Post-treatment, head to the quiet relaxation room with its stunning panoramic views for a delicious sorbet; there are even adult colouring books to calm your mind. The Kinmel and Kinspa is a large, sprawling white hotel and spa in a Welsh valley, surrounded by tree-lined hills and farmland. While the grounds are small, the gardens themselves are colourful and peaceful. The hotel is bright, vibrant and, on our visit, busy with happy guests. A flower-lined path leads you to the spa which is a sympathetic modern extension to the main building. As you near, you hear the sound of trickling water as it runs into the pond; the scent of a NEOM reed diffuser fills the air, putting you in the spa mood. The Kinspa is split over two levels and packs a lot into a relatively small space. We received a warm welcome at the light and airy reception. Ella, our spa host, gave us a quick tour of the spa. The small, taupe-tiled changing rooms contain dark wood, coded lockers, each with Kinspa flip-flops, a taupe robe, and a towel inside. Two showers have Elemis shampoo, conditioner and shower gel. A well-stocked vanity area has two hairdryers, spare towels and all of the Elemis products you could need for post-spa preening. Tucked around the corner is a large private changing cubicle. The grey-slate thermal area is on the lower level. The 9-metre pool is just long enough for some leisurely lengths and is attractively bathed in pink and blue lights. Help yourself to cold water from a water fountain and settle down on a comfortable lounger. Next to the pool is the star of the show: a delightfully bubbly hydro-pool. Three steps lead down into a section with powerful jets and seating for four; through the water curtain is a larger area with a swan-neck fountain and sliding door leading outside. We loved the cool breeze on our faces as we bubbled away, listening to birds chirping in the garden and admiring the view of the hills. Back inside, we tried the aromatherapy steam room which was large and warmly lit, with a refreshing eucalyptus scent on our visit. The sauna, which overlooks the pool, is smaller (seating around eight) but was perfectly hot. Cool down with the ice bucket afterwards; just try not to squeal as the ice water hits your head. The main relaxation area is upstairs, at the end of a candle-lit corridor. Look out through floor-to-ceiling windows; on a clear day, you can see out to the sea. The six beds have their own fluffy grey blankets next to side-tables stocked with magazines. Help yourself to tea, coffee, water, juice and, on our visit, fresh pineapple slices. There's a fully-equipped gym at The Kinmel and Kinspa, too. We enjoyed a NEOM Happiness Massage (90 minutes, £92). My therapist, Stephanie, showed me through to a dimly lit treatment room with flickering candles and soothing classical music. She invited me to sit down so that we could discuss areas of concern (my shoulders and back), as well as my desired pressure; as I am quite ticklish, I opted for medium pressure. Stephanie talked me through the process of the massage before asking me to get comfortable on the treatment bed, lying face up. Stephanie began the treatment with a NEOM opening ceremony: a spray of mist into the air which I breathed in slowly. Stephanie poured some warm oil onto my face before moving down the bed to slip some hot slippers onto my feet. This felt wonderfully soothing. The gentle reflexology that followed helped me to relax and unwind. For the scrub, Stephanie covered each leg, both arms, my tummy and décolletage with a NEOM body scrub which felt exfoliating without being too abrasive. Stephanie turned on the shower and stepped out of the room so that I could rinse the scrub off; my skin immediately felt silky smooth. When I was back on the bed, this time on my front, Stephanie began the massage on my legs using broad, targeted strokes. She turned her attention to my arms and hands, back and shoulders. I could feel all the tension disappear and felt light as a feather. Stephanie asked me turn onto my back so that she could repeat the massage on my front, paying attention to my arms and hands, which felt very grounding. Stephanie ended this very relaxing treatment with an uplifting facial massage, ending with a scalp massage. The NEOM Happiness Massage closed with a refreshing raspberry sorbet which I ate in the relaxation room whilst gazing at the countryside. Kinspa offers a range of facials and body treatments by Elemis, NEOM and Willow organics, as well as holistic treatments such as reflexology, and treatments specifically for men. Finishing touches include manicures and pedicures by Jessica and make-up by Mii. You can eat lunch in your robe in the warm and welcoming Chiang Mai restaurant, which serves Thai cuisine with a twist, as well as some British classics. 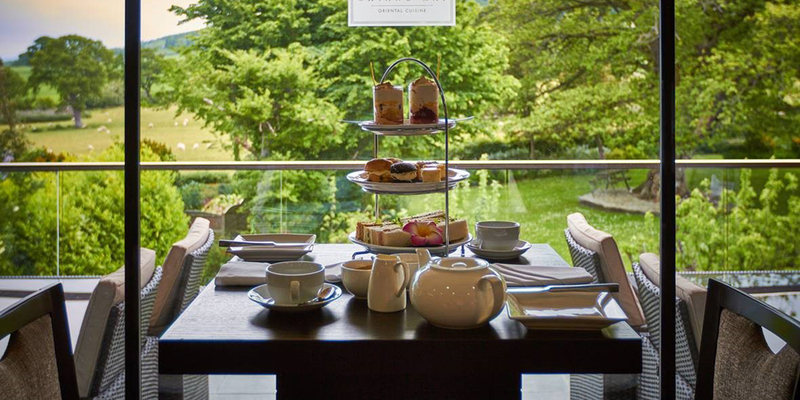 We opted for the vegetarian savoury afternoon tea which consisted of finger sandwiches, cheese scones with tomato relish, vegetarian baked roll, and oat cakes. We washed this down with a cheeky glass of bubbly. If you're staying overnight, you'll eat dinner in The Kinmel restaurant. Our starter of tomato consommé, goat's cheese, black olive and smoked tomato sorbet was a real showstopper. The salmon main course and strawberry parfait dessert were great dishes, too, coupled with some delicious Pinot Grigio. The hydrotherapy pool: We could have spent hours bubbling away outside, gazing at the Welsh hills. The staff: Everybody was warm, friendly and welcoming; nothing was too much trouble. Our treatment: Our NEOM Happiness Massage left us feeling totally uplifted and revived. The small changing rooms: While the spa was quiet on our visit, we imagine at busier times this space could feel a little cramped. Solo spa-goers: We felt welcome and at ease on our visit. Couples: The Kinmel and Kinspa is a romantic place with its outdoor hydro-pool and plenty of areas for couples to cosy up. On previous visits, we have seen small groups of friends and mothers and daughters enjoying the spa, too. Lovers of Thai food: The restaurant serves authentic Thai cuisine with a delicate twist. 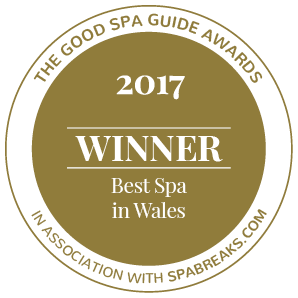 We awarded The Kinmel and Kinspa a Good Spa Guide Bubble Rating of 5 Bubbles. This delightful country retreat may be on the smaller side, but it has everything you need for a relaxing spa day. The service, thermal facilities, treatments, food and views are all top-notch. Super Spy visited in October 2018 and awarded it 5 Bubbles. "Lovely friendly staff, I had an amazing relaxing day here. I had plenty of treatments to choose from and the facilities are fantastic. Can’t wait to go back again soon "
"Kinspa is simply the best spa by far! Everything is just perfect for any occasion. And the Chiang Mai restaurant is amazing. Set in beautiful surroundings. It's my absolute favourite retreat. " "fantastic place, staff are AMAZING and deliver brilliant treatments in a relaxing environment. nothing is too much trouble you are made to feel amazing." "Love having my facials there x"
"I'm spending all day at the spa tomorrow. I visited in June and had the most amazing day there. The booking was simple and helpful. The staff were very professional and friendly. The massage was the best I've ever had. I will be visiting over and over again with barious friends and family. " The spa features a Thai restaurant which serves a Thai food and afternoon tea menu. The hotel's Brasserie 1786 offers fine dining in an informal atmosphere. The hotel offers forty rooms including double rooms, twin rooms, executive rooms and suites. The thermal spa experience and gym are open Monday to Thursday: 7am-10pm; Friday: 7am-9pm; Saturday to Sunday: 8am-9pm. Treatments are available Monday, Tuesday and Thursday: 10am-8pm; Wednesday, Friday and Saturday: 10am-7pm; Sunday: 9am-7pm.